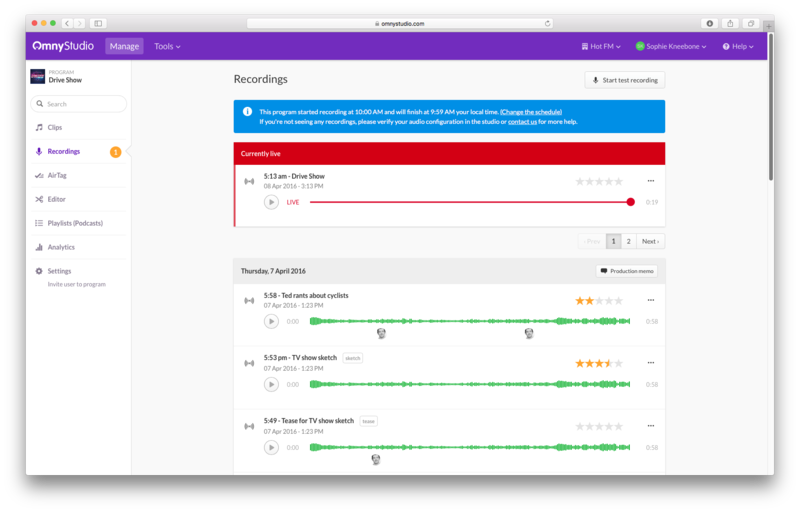 Live recordings are audio segments automatically captured from the Omny Studio Recording Agent either set up in your studio or capturing from your live stream. Live recordings will be captured when audio is heard during a program’s recording schedule. Live recording appears at the top of the recordings list with a red background. When a recording is live, you can still click on it to edit the title, description and add annotations. Omny Studio offers several ways to capture live recordings into Omny Studio. Head to organisation settings - live recording and click "set up new recording agent". From here you can choose to set up either an ICE or SHOUTcast live stream agent, a Triton live stream agent or an on-premise agent. With compatible SHOUTcast, ICEcast or Triton Live streams we can use the metadata within your live stream to trigger and segment your recordings. We can then customise which recordings appear in your portal so that no ads are recorded in for example. Omny Studio can automatically capture the audio from your studio in the best format by using a small piece of software known as the Recording Agent, which runs in your studio, delivering the best possible recording experience. Please read the on-premise recording agent installation guide to get started. Please contact support staff at support@omnystudio.com if you would like to discuss a custom solution. Once your agent has gone online, you're ready to schedule your shows - click here for a step-by-step instructions.